Even as bright flowers, longer hours of sunshine and gradual warmth abound in the spring, many of us have encountered emotional potholes in this otherwise cheerful season. Whether you are rebounding from the stress of Spring holidays, winter weight gain or infertility, here are some thoughts on how to set your sights on moving forward! HOLIDAYS are a time when we are expected to be celebratory. But the gathering of families, complete with familiar roles and lurking conflicts, can contribute to tension of spring holidays like Easter, Passover, Mother’s Day and Father’s Day. Not surprisingly, these spring holidays have a theme of life and reproduction running through them, which can be haunting for families who have lost a loved one or whose infertility prevents them from being celebrated as a mother or a father. If you are rebounding from feelings of disappointment or regrets associated with any of these holidays, you may want to spend some quiet time thinking through what you would like to have done differently this year. Perhaps you might have been involved with more supportive family members? Interspersed a family gathering with some quiet time or a stroll with a loved one? Called a friend who shares your sadness associated with a holiday so you could offer support to one another? It’s a challenge to feel entitled to emotions of regret when others around you are celebrating. But if you have these emotions, try to talk about them with a loved one. And, in addition to considering that you are rebounding from some stress now, also keep in mind for next year what strategies you might plan in advance as spring holidays approach. HEALTHY WEIGHT is always a goal to strive for, but as spring approaches and our heavy sweaters no longer disguise the pounds we wish we could lose, stress can be one response to that realization. But if you’re trying to rebound from that stress, find a friend who can join with you in some healthy resolutions. Perhaps you can plan a brisk walk on a regular basis. Or join a gym and take some classes. Or sign up for a weight loss program. All of these possibilities give you the support of others, as well as the motivation to “stick with it.” Then there are some more solitary behaviors that may feel more possible to embrace now that spring fruits and vegetables offer opportunities for healthy eating. Brian Wansink, a professor at Cornell University who focuses on food psychology, reminds us that mindless eating causes people to consume far more calories daily than we are aware. He and other food experts encourage people not to include eating as a part of their multitasking but, rather, to focus clearly on being aware of food in all its dimensions: its taste, texture, color, flavor and deliciousness. As someone who researches the size and shape of our serving dishes, Wansink encourages us to use smaller plates and glasses for our food and drink as a way of controlling portions. And, in the spirit of mindful eating, many nutritionists stress the importance of focusing on food as it is being consumed at the meal table, rather than in front of the TV, while multitasking with our mobile devices, and to avoid sampling food while preparing a meal or nibbling a few last bites of leftovers before washing the dishes. For many people, specific medications may contribute to weight gain. This can be a side effect of some antidepressants. Hormone treatments used by women being treated for infertility may also cause weight gain and mood swings. So it is useful for everyone to try to pinpoint the underlying cause of unwelcome pounds before you make a plan to rebound toward a healthier weight in the spring months. INFERTILITY can feel especially emotion-laden in the spring. Heavy clothing is coming off of both close and casual acquaintances, sometimes to reveal baby bumps. Mothers are pushing strollers everywhere outdoors, so it no longer is enough to avoid the local mall if infants bring envious tears to your eyes. And, then there have been the spring holidays, replete with pregnant and nursing relatives, flowers and eggs as celebratory reminders of fertility, and (we take a deep breath here) Mother’s Day and (yet to come) Father’s Day. So how can you feel you’re rebounding when reminders of your infertility are lurking at every turn? For starters, we can remember that Spring is also a season of “beginnings.” So now is a good time to think about taking new action in addressing your hopes for parenthood. If you’ve been relying on local physicians, now might be a good time to seek the services of an infertility clinic which, among its many advantages, diagnoses and treats both the male and the female as time-efficiently as possible. Another service provided by many infertility clinics is individual, couple and group counseling. You may feel that you’re coping okay, thank you, but keep in mind that counseling can offer new coping strategies that you might not have considered or tried. So even if you’re not a patient at a clinic that offers counseling, think about going to some support group meetings in your locale (consult the RESOLVE website at www.resolve.org) or seeking out a counselor in your community who can help you over the inevitable rough spots, as well as suggest strategies that will strengthen your emotional resilience. 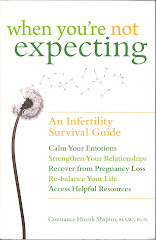 And, as readers of my recently-published book know (When You’re Not Expecting), emotional support during infertility can also be offered between the covers of a book – mine captures the words of a sisterhood of several hundred infertility survivors, each of whom shares her own strategies of coping across the entire spectrum of infertility diagnosis, treatment and pregnancy loss. And as I mention pregnancy loss, let me say that many couples who have had this emotion-laden experience and later grief over shattered dreams find that counseling can ease the pain, especially as a counselor will be the first to understand when you confide that loved ones seem to want you to “get back to your old selves,” rather than giving you support as you strive to rebuild your lives. One way many couples use the springtime is to plant a memory garden to honor a lost pregnancy or a stillborn infant. Although you will want to be aware that you may, at some point, move away from your current home with its memory garden, the very designing of it, as well as the process of planting, can feel therapeutic. Should you move, you may decide to preserve the garden in a photograph or painting you hang in your new home or to re-create the garden at your new residence. So spring flowers can be both an emotional tribute and a poignant reminder of dreams deferred. Lastly, in the spirit of rebounding, now is a good time, before Father’s Day arrives, to think about how you have coped with the challenges of your infertility this spring, and what you might try to do differently next spring with its reminders of fertility at every turn. 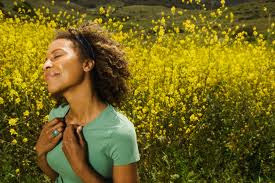 So, as we think of rebounding in the spring, whether it is from the stress of spring holidays, unwelcome weight, or infertility, the real issue is how to think about the stress as an ongoing learning experience. Stress is with us in all seasons, for lots of different reasons. What matters more than the existence of stress is how we use those experiences to move forward rather than to get emotionally bogged down with anger, regrets and self-blame. So, whatever issue in this blog resonates most strongly for you, take the rebound perspective (start with small steps) and see whether you can feel empowered to use the spring as a season of positive change. Good luck!